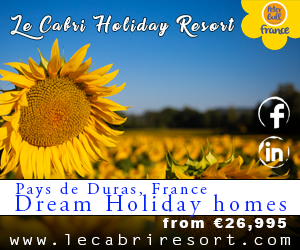 Stretching along the Mediterranean coast between Provence and the Pyrénées mountains, this region offers a fascinating cultural heritage, a mild and sunny climate, and truly remarkable scenery. It’s no wonder that the area is consistently among the top choices as a preferred location for residential and holiday homes. 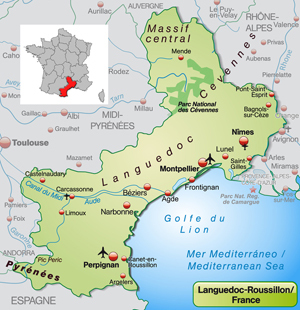 The Languedoc Roussillon is part of the Languedoc-Roussillon-Midi-Pyrénées, one of the 13 regions of France created by the merger of Languedoc-Roussillon and Midi-Pyrénées regions, following the territorial reform in effect from January 2016. The main population hubs are Toulouse, Montpellier, Nîmes, Perpignan, Carcassone and Béziers. Administratively the region included five departments before the merger: the Lozère, Herault, Gard, Aude, and Pyrénées-Orientales. This part of France offers an exciting and rich blend of cultural identities. Prior to the 20th century, Occitan was the language spoken in Languedoc, and Catalan was the language spoken in Roussillon. The southernmost Pyrénées-Orientales is roughly equivalent to the geographical limits of the former Roussillon, which in turn was part of Catalonia until 1659 when it was claimed by France. In the rest of the region there are still proud communities still practising the Occitan language (langue d’oc from which it derives part of its name). This living heritage is evidenced everywhere you go, in the historical sites, arts and crafts, and the hearty and varied gastronomy. The region has been an important winemaking centre for several centuries, and the largest in France. With over 700,000 acres (2,800 km2) it covers three times the combined area of the vineyards in Bordeaux. Languedoc-Roussillon is a very large region extending from the Provence to the borders of Spain. It also has very varied landscapes, from coastal resort towns, regional parks and small ski stations in the Pyrénées to large, vibrant cities such as Montpellier. 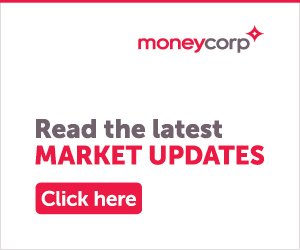 It is therefore no surprise that prices vary widely from one part of the region to another. As a rule of thumb: the closer to the coast or the closer to Provence you go, the more expensive the properties are going to be. Over the last decade, Languedoc-Roussillon has become a hotspot for foreign buyers wanting great Mediterranean weather and easy access to the sea without paying Provence property prices. Languedoc enjoys a Mediterranean climate with long, consistently hot summers and temperate (if sometimes rainy) winters – you can reasonably expect 300 days of sunshine a year. But because it’s a large region there will be regional differences – mountainous areas can experience snowfall, while sheltered coastal areas are hotter than inland sections. There are several airports providing excellent access to the Languedoc, including Béziers airport, Carcassonne airport, Nîmes airport, Montpellier airport and Perpignan airport. Toulouse airport also provides a good entry point. By road, the region is easily access from Paris via the A10, A71 and A75 motorways. Those travelling from the northern French ferry ports such as Calais will have around a 10-12 hour drive. The TGV rail route serves nearby Avignon from Paris. There are beautiful unspoilt areas of the Languedoc often referred to as the “real south of France” that typify what the dream of a house in France is all about. You will find vineyards, beautiful beaches, character villages and sleepy towns. It’s a haven for people interested in fishing, canoeing, kayaking, walking, or sailing. The pace of life there is slow and relaxed, and the people are friendly. If you are looking for a secluded country retreat to live in as a permanent residence, it is a good idea to visit at different times of year check that the area is not too quiet in the off-season. Character properties are irresistibly charming, and there are tight controls in place on villages or historical monuments protected by the Bâtiments de France regulations designed to ensure their preservation. If you are planning to buy a property to renovate, check that your project will pass local and heritage regulations, as this will affect the type of materials and architectural style allowed, and could make it a little more convoluted to obtain building permission. The Languedoc-Roussillon is also home to a dynamic economy and industry, in some spots so you will also find new builds, urban development, and the traffic, road and transport improvements that come with such expansion. Before you buy, ask around at the Mairie and consult your property professional about any plans for new housing, roads, train links or commercial areas that may affect your property or the immediate surroundings and views. 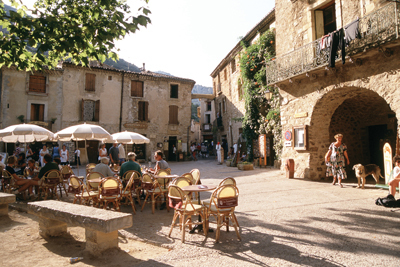 Village or town houses are a firm favourite with foreign buyers in the Languedoc Roussillon. They are full of charm and character in pretty and lively medieval villages, and within easy access of shops and restaurants. No garden attached to the house? No problem! Many of these houses have been granted permission for a rooftop terrace. Depending on the location and standard of the property, count between €100,000 and €350,000. 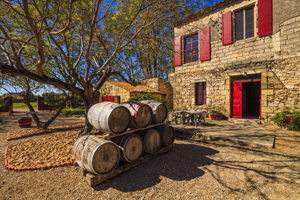 Despite being a more modern type property, villas are very popular in the Languedoc region. Recently constructed, they offer modern convenience features such as air conditioning or reversible heating. Many of them come with a pool and covered terrace, making them the perfect house for summer evening BBQ diners. Depending on the size of the house and the plot and the location, villas average between €250,000 and €500,000. Typical of the Languedoc-Roussillon as their name states, these were originally built as village homes for wine growers (paysans) with space to store their agricultural gear and tools in a large ground floor garage. Most of them are in the centre of villages, they are usually not surrounded by land but they are extremely spacious inside. Average prices of these properties vary between €200,000 and €600,000. The region being a very popular tourist destination, with great access to beaches, ski stations and also historical cities (as well as an extended rental season due to mediterranean climate), it is no surprise that gîte business properties are highly sought after by foreign buyers. Depending on size, location, amenities and services offered, the going price for an existing gîte business ranges between €400,000 and €900,000. Since it is along the coast of the Mediterranean sea, is the Languedoc similar to Provence but cheaper? As much as there are some similarities, such as the great weather, the two areas are very different. Languedoc-Roussillon is very protective of its countryside and coastal zone and despite being very popular with tourists, it has kept away from mass tourism in order to keep its very strong cultural identity. People who move to the area from somewhere else (French or foreign alike) always fall in love with the area because of its relaxed lifestyle where you always in touch with nature. Is there good seasonal rental potential for second homes or investment property in the Languedoc? As much as the region has managed to steer clear of mass tourism, it is very popular with visitors looking for a relaxing holiday. The region has a lot to offer and appeals to a large range of holidaymakers seeking access to beaches, ski stations, regional parks and lakes but also for its strong cultural heritage. With several international airports (see above) and a good motorway network, Languedoc-Roussillon is very well connected to other parts of France and Europe. 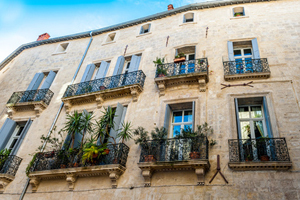 It’s important not to forget that compared to some other regions in France, the area benefits from a warm Mediterranean climate which makes for an extended holiday rental season. 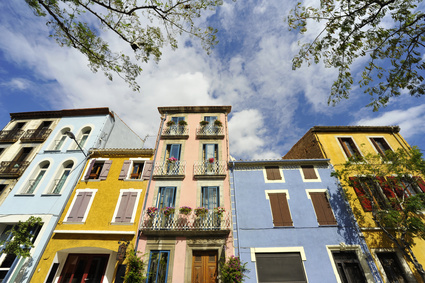 Can I find a townhouse for less than €100,000 in Languedoc-Roussillon? The quick answer is yes, it is possible. However, you might be restricted in terms of the area for your search. As explained, the closer to the coast and large cities you go, the more expensive properties get. For bargain properties, it’s best to look inland in the Corbières and Minervois, or in the little towns and villages north of Béziers towards the regional park.